Buttery shortbread cookies with chopped pecans, dipped in chocolate and sprinkled with toffee bits. I was inspired to make these cookies from a recipe for Coffee Toffee Shortbread in Sally’s Cookie Addiction (my favorite cookie cookbook). She mixes espresso powder and toffee bits into her dough. I don’t drink coffee (or like the flavor), and I find that toffee bits often dissolve into nothingness and lose their crunch when baked. So I’ve made a few tweaks to this recipe that I think you’re going to love. Keep reading to find out what they are! First you’re going to whip up your dough. (I do suggest using a mixer rather than your arm and a wooden spoon, unless you want to become super buff. In which case, make sure to stir with both arms, so both of your arms will become equally buff). Add 1 1/2 cups of softened butter to a stand mixer and beat the heck out of it for about a minute on medium-high speed. Add 1 cup powdered sugar and 1 teaspoon pure vanilla extract to the butter and beat on medium-high for about two minutes. (Start beating on low unless you like powdered sugar flung all over your kitchen). Use a spatula to scrape the sides and bottom as needed. Now you’re going to add 2 3/4 flour, 1/4 cup at a time. Just turn your mixer on low and add in 1/4 cup. When it is blended, add the next 1/4 cup. Add 1/4 teaspoon of salt and 1 cup chopped pecans and beat on low speed. Then turn the speed up to high and beat until the dough is smooth. If it isn’t smooth after two minutes, just add 1-2 teaspoons of water and beat a little more. Now it’s time to roll and cut the dough. Divide the dough into two pieces and pat down on a lightly-floured work surface. Sprinkle a wee bit of flour on the top, and then gently roll it out with a rolling pin, about 1/4-inch thick. Now grab a handy dandy pizza cutter and cut your dough into squares. I cut mine 2 1/2 inches square, but in retrospect, two inches would have been sufficient. Place these three inches apart on parchment-lined baking sheets, or baking sheets with silicone mats. Bake the cookies at 350 degrees F. for 11-13 minutes. Allow to cool for five minutes on the baking sheets before transferring to a wire rack to cool. Once the cookies have cooled, melt your chocolate (can be candy bars, chocolate chips, or almond bark) and dip the corner of each cookie into the chocolate. Place on parchment paper to allow the chocolate to set up. While the chocolate is still wet, sprinkle with toffee bits. Let the chocolate set up completely before serving. These are great cookies for weddings, bridal showers, baby showers, and Christmas! Experiment with different mix-ins and toppings. Have some fun! Then try to eat just one. Or three. Or five. Let’s not limit ourselves, shall we? 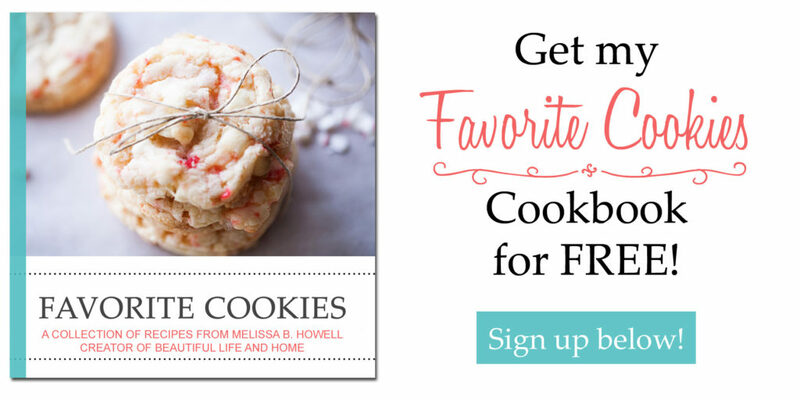 For more fantastic shortbread cookies, try my Raspberry Lemon Butter Cookies, Peppermint Chocolate Slice and Bake Cookies, and Lemon Pistachio Shortbread Cookies. Buttery shortbread cookies with chopped pecans, then dipped in chocolate and sprinkled with toffee bits. Preheat your oven to 350 degrees. Line cookie sheets with parchment paper or silicone mats. In a large bowl, beat the butter on medium-high speed for one minute. Add the powdered sugar and vanilla. Beat for a few seconds on low speed until the powdered sugar is partially mixed in. Then beat for about 2 minutes on medium-high speed, until creamy. Scrape down the sides and bottom as needed with a spatula. Turn the mixer on to low speed, and add the flour in 1/4-cup increments. Once all the flour has been mixed in, add the salt and chopped pecans. Turn the mixer to high and beat until the dough comes together. If the dough is not smooth after two minutes of beating, add 1-2 teaspoons of water and beat again. Divide the dough into two portions. Roll out half the dough onto a lightly-floured surface. Make it 1/4-inch thick. Use a pizza cutter to cut the dough into two-inch squares. Transfer the squares to your cookie sheets, spacing them about three inches apart. Bake for 11-13 minutes until the edges start to brown slightly. Remove from the oven and allow to cool for five minutes on the cookie sheet before transferring to a wire rack to cool completely. When the cookies are cool, melt your chocolate in a double boiler on the stove, or in the microwave in 15-second increments, stopping to stir after each, until completely smooth. Dip the corner of each cookie into the melted chocolate and place on parchment paper to cool and set up. Before chocolate has completely dried, sprinkle with toffee bits. Allow to dry completely, then serve or store in an airtight container for up to one week. Mmmmm… Shortbread and Toffee!!!!! YUM!!! Love the toffee – pecan combination! Shortbread cookies are awesome, and these look perfect! I am not a coffee drinker either!! Hate the taste but I love the smell. I have to agree that the toffee bits just disappear when baked in cookies too! I LOVE buttery shortbread and even better that it’s dipped in chocolate and toffee bits! Can’t wait to try these! I love shortbread, and this looks amazing!